Legendary 3M inventor of the Post-it Note, Art Fry, shares his words of wisdom on innovation, creativity and getting disruptive products into the market. A wonderful read for all innovators, designers and entrepreneurs. Q – Fact or fiction: Post-it® notes were an accident? Art – A lot of people would like to think that you get something for nothing. A discovery might be an accident. But an innovation requires so much work. I use the analogy that we’re all working under a street light. We’re acquainted with what we see and work with day in and day out. But out there in the darkness there is so much stuff that we don’t know about that if we send somebody out and they feel around and find something and bring it back, we all have something we can work on. But sending those people out to look is not an accident. Here are a few more notable quotes which showed how a disruptive innovation, something people do not understand, is made acceptable to consumers by going through a process of design thinking anchored by critical insight, observation and user centered research. Q – The design of the Post-it® notes begs several questions. Why was canary yellow the original color? Art – …the distributors and dealers said, “We don’t believe that stuff is going to sell. We’re not going to give you all that shelf space. We’re going to give you just enough shelf space for one color and two sizes.” So what size? We didn’t want it to be pink or blue and step on anybody’s toes as far as male and female preferences. Yellow seemed to be a very natural one because it was cheerful and the eye can see black on yellow with very low distortion. Q – When they were introduced in 1980, Post-it® notes came in two sizes – three inches by five inches and one-and-a-half inch by two inches. What was the thinking behind these sizes? Art – We wanted a small note that didn’t take a lot of space for people that just wanted them for a bookmark or a flag to get people’s attention. And, then, for those who wanted to write a little bit more, something bigger – a 3×5. Now there was a lot of pressure in the beginning to make them in 4×6. That was the size of scratch paper folders that were on the desks of most executives. But you couldn’t stick a 4×6 note in your pocket. The 3×5 would go in. So we wanted the large one and a small one. After we’d been selling the product a few years and the sales had built up to the point where now we could have more sizes in our line, we added a 3×3. It’s one of the most popular sizes. Q –So the size can be traced back to convenience? Art –Again, it’s designing it for a customer need. In the beginning there also was a lot of pressure on me to make it in roll form. Because nobody knew how to make sticky sheets in a pad. Can you imagine how inconvenient it would be to have a roll of notes in your pocket? For the customer, we clearly needed a pad. No one knew how to do it. But that’s the direction we took and we learned how to do it. Q – You’ve said that most everybody in 3M management, marketing and sales initially thought “sticky notes” was a dumb idea that was too expensive and wouldn’t sell. What kept you going in the face of strong opposition? Art – That’s part of the game. I was in new product development for 20 years previous to that. I knew that when you have something that’s new to the world, it takes a lot of convincing. People don’t see it right away. That’s almost a good thing. If it were easy, somebody else would be doing it. So the challenge is something that keeps people like me going. And, then, I just knew better. I knew that folks that were using the pads were using between seven and 20 pads per year around 3M. Well, that was enormous compared to the Magic™ tape that was the cash cow for our division. They were using one roll of Magic™ tape per year. So when I said this was going to be seven to 20 times bigger than Magic™ tape, people were incredulous. They wouldn’t believe it. They thought, “Go back to the lab; you don’t know anything about marketing.” But I knew people’s addictions to the sticky note when I gave them samples. This proves that having a great idea is only a small fraction of the entire process. And if we look at what Art had to go through, it was a long and laborious process indeed! 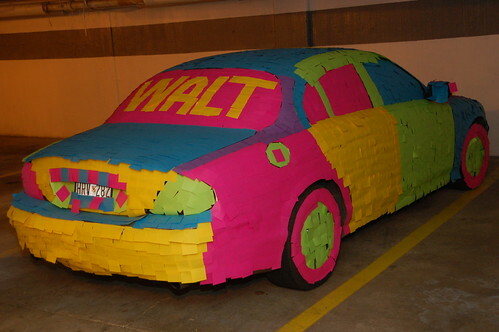 Q – In reading the history of Post-it® notes, it’s clear that the Marketing department was boring some of those holes? This interview really reminds me of our earlier discussion that User Centered Innovation is Dead. What a really interesting set of real life examples of when User Centered processes should come in and when it was a mistake or a hindrance. Art made a lot more interesting and notable points, especially on the work culture at 3M and allowing their employees to spend 15% of their work time on free play, in the full interview at Eastman Innovation Lab. Enjoy it with a cup of coffee as it is a quite a long read! It’s interesting to see the insight from the man behind such a legendary product. Thanks for sharing!